The Christian communities in Acts suffer almost from start to finish. Shortly after they begin to preach in Jerusalem, Peter and John are brought before the leading council (Sanhedrin) to account for the ruckus that accompanied the healing of a lame man. The apostles are released, but they are ordered “not to speak or teach at all in the name of Jesus” (Acts 4:18). As anyone familiar with the apostle Peter would know, this is something he cannot do. And, of course, he does not intend to be quiet. So again he preaches and is quickly imprisoned. Though the advice of the Pharisee Gamaliel prevents their deaths, the apostles are nevertheless beaten and ordered once again to be silent. As the story progresses, Stephen the deacon is stoned to death by his own people, and James the brother of John is put to death by King Herod Agrippa. During his journeys, Paul is -- among other things -- stoned and left for dead in Lystra, flogged and imprisoned in Philippi, put on trial for his life in Athens, and nearly killed in Jerusalem by mob violence and then a secret plot on his life. Other Christians, too, find their lives in danger. In Thessalonica, for example, Jason’s house is attacked, and he “and some of the brothers” face a potential mob killing. And in Ephesus Alexander is shoved forward into a seething mob in the theater to answer for the problem the Christians are causing the city’s craftsmen. In addition to explicit portrayals of fierce conflict in Acts, there are also statements that simply presuppose suffering as a regular part of the life of Christian communities. After Paul and Barnabas preach in Derbe, for example, Luke tells us that they return to Lystra, Iconium and Pisidian Antioch “strengthening the souls of the disciples, exhorting them to continue in the faith, and saying that it is through much suffering that we will enter the kingdom of God” (14:22). If we expect to see the kingdom of God, we should also expect to suffer. A more direct statement about the presence of suffering in Christian communities would be hard to find. Where modern sensibilities might teach us to recoil from such numerous difficulties, Acts shows that the early Christians had a much different response. After the Christians’ release by the Sanhedrin the second time, they “rejoiced because they had been considered worthy to suffer shame for [Jesus’] name” (5:41). A flogging by the Philippian magistrates leaves Paul and Silas in prison “praying and singing hymns to God” (16:23-25). When the disciples in Caesarea do not want Paul to go to Jerusalem, where he will likely die, he responds that he is ready to “die in Jerusalem for the name of the Lord Jesus” (21:13). 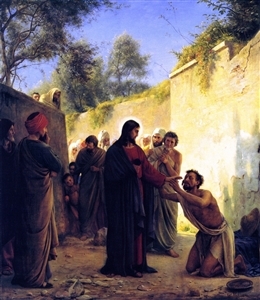 His willingness to go is simply an outworking of Jesus’ call on his life: Jesus told Ananias that Paul would be shown how much “he will suffer for my name” (Acts 9:16), and the Holy Spirit has confirmed Jesus’ words and revealed to Paul that “in every city, prison and afflictions” await him (20:23). In short, the early Christians not only assume that suffering will be part of the pattern of their lives; they also rejoice in the occasion for such affliction -- that it gives them an opportunity to witness to the Lord Jesus. Reading Acts shows us that when we take suffering seriously as part of a thriving community, we should simultaneously see that there is a sense in which thriving Christian communities consistently run the risk of being an offense to the world, a problematic thorn in its side. Acts would instruct us, that is, to be suspicious of our tendencies to think that if we develop thriving communities we will be well-liked, or be rewarded for our work, or appear attractive and exciting. We cannot even suppose that because our community is thriving people will want to join it en masse or come to work with or for us. Learning from Acts requires us to learn that to thrive in a Christian sense is also to provoke, to remind the world of both its brokenness and its hope. But all this suffering, someone might object, is the sort that has an explicit purpose, suffering that springs from the character of Christian witness. What about the sort of suffering that is not “for” anything at all, or at least anything that we can identify? Random illness, abusive violence, disasters of various kinds -- surely these are not constitutive of a thriving community. And they are not. Luke, too, knows about indiscriminate and blameless suffering, and he rejects the all-too-common notion that all suffering is somehow traceable to our sin. Some people told Jesus “of the Galileans whose blood Pilate had mingled with their sacrifices. And [Jesus] answered them, ‘Do you think that these Galileans were worse sinners than all the other Galileans, because they suffered thus?’” His answer was unequivocal: “No.” So, too, “those eighteen upon whom the tower in Siloam fell and killed them, do you think that they were worse offenders than all the others who dwelt in Jerusalem?” No, Jesus said, they were not (Luke 13:1-5 RSV). In his book that reflects on the theological questions embedded in the effects of the disastrous Asian tsunami of 2004, David Bentley Hart observes that proper Christian theology does not believe that all suffering serves some larger purpose of God -- that the world as we find it is the best of all possible worlds and that all things fit into some larger sublime plan. To the contrary, says Hart, “God will not unite all of history’s many strands in one great synthesis, but will judge much of history false and damnable; … he will not simply reveal the sublime logic of fallen nature, but will strike off the fetters in which creation languishes; and … rather than showing us how the tears of a small girl suffering in the dark were necessary for the building of the Kingdom, he will instead raise her up and wipe away all tears from her eyes” (“The Doors of the Sea,” 104, with reference to Dostoevsky’s “The Brothers Karamazov”). Hart’s argument in this book should be read by all Christians who think about suffering. It is a crucially important and theologically profound corrective to the shallow or sentimental prattle we usually encounter in the face of overwhelming sorrow. Though it does not use Hart’s terms, the book of Acts illustrates a lived version of Hart’s response to the world that brings us suffering. Acts portrays Christian communities that thrive despite suffering -- not because of an affirmation of the meaningfulness of all difficulty but because of the hope they know from the pattern of Jesus’ life. One may well be innocent and still wind up tortured and dead (Luke 23:4, 33; Acts 23:29; 25:18-19; 26:31-32; 20:25, 38). In the face of this truth, there remains the steadfast hope of resurrection. Jesus, that is to say, was both crucified and raised. And that is, after all, why suffering is ultimately an indispensable part of Christian community: it was part of Jesus’ own existence. We follow in his pattern, Acts teaches, insofar as we exist in the reality of crucifixion and hold fast to the hope of resurrection. The opinions in this essay are those of the author and do not necessarily reflect the position or policies of the Florida Conference.